Samuel T. Douglass was born in Wallingford, Vermont, on February 28, 1814. His parents later moved to Fredonia, New York, where Douglass spent his early years. He was educated at Fredonia Academy, later studying law in the office of James Mullet, who was for many years a Judge of the Supreme Court of New York. Douglas came to Detroit in 1837, and was admitted to practice as an attorney later in that same year. Except for a brief time spent working in Ann Arbor, Douglass practiced his profession, as both attorney and judge, in Detroit for over 50 years. In 1849, he entered into partnership with James V. Campbell, whose sister, Elizabeth, he later married in 1856. In 1845, Douglass was appointed Court Reporter of the Michigan Supreme Court, serving until 1849, when he voluntarily resigned. During his tenure as Reporter, the first two volumes of the Michigan Reports were published, covering the period from 1843 through 1847. Douglass served as Judge of the Wayne Circuit and Michigan Supreme Courts. 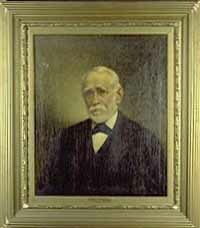 When a separate Michigan Supreme Court was organized in 1857, he was nominated by the Democratic Party. Since the Democrats were, at that time, a hopeless minority in the state legislature, his competitor, former partner, and brother-in-law James V. Campbell, was appointed. In May of 1857, Douglass resigned the circuit judgeship and returned to private practice. ii. Benjamin Douglas, b. 10 Dec. 1859, m. 1 May 1890, Margaretta Porter Biddle of Grosse Ile, Mich.
iii. Elizabeth Campbell Douglas, b. Grosse Ile, Mich. 8 Apr. 1862, m. 14 Feb. 1885, Lewis Phillips Hall of Ann Arbor, Mich. Children, 2: i. Douglas Hall, b. Nov. 1885; ii. Louis Phillips Hall, b. June 1889. Douglas" grandfather was Daniel Douglas, captain of a regiment of Connecticut Volunteers in the Revolutionary War. The pioneer of his family in the New World was Robert Douglas, born in Scotland in 1639, who married Mary Hempstead, the first child born in New London, Conn.
837: Michigan is admitted to the Union as the 26th state. 1841: The University of Michigan moves from Detroit to Ann Arbor. 1842: Copper mining operations begin near Keweenaw Point. 1844: Iron ore is discovered in the Upper Peninsula at Negaunee. 1847: The Legislature passes a law to locate the state capital in Lansing. 1854: The Republican Party is organized in Jackson. 1855: The ship canal at Sault Ste. Marie opens. 1861-1865: More than 90,000 Michigan men are mustered into service during the Civil War. 1879: The new Capitol is dedicated in Lansing; the structure cost $1,510,130. 1908: Ford begins manufacturing the Model T.